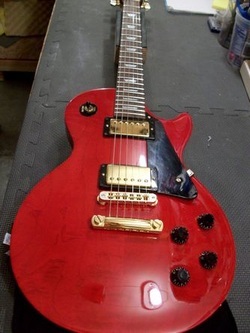 I recently took in this beautiful Les Paul Studio that had a not so beautiful fret buzz on various places on the neck. 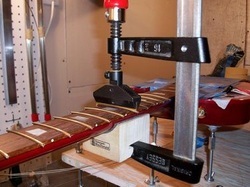 After checking the normal things like truss rod and fret level it was discovered that the frets were in need of leveling EXCEPT after a fret level the buzz was still there! You can see here how twisted the neck is. 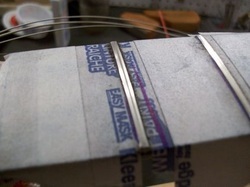 It was high on the bass side to the 17th fret and low on the treble side from the 4th fret to the 17th. You can't get a guitar to play right when the neck twists like this. 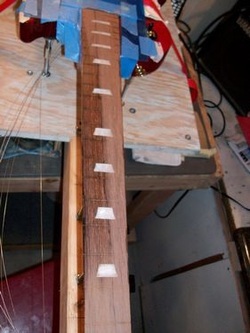 After getting the fretboard nice and flat and returned to a 12 inch radius the fret slots needed to be lowered to .075 to fit the wide/jumbo fretwire that was going in. 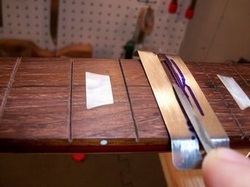 Before installing the frets I put a slight bevel on the edges of the fret slots. 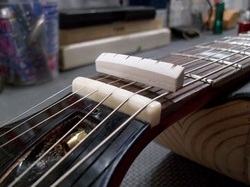 This does two things; first it allows the frets to seat better because the frets don't form a perfect 90 degree angle where the tang meets the crown and it will help to avoid fretboard chipping if the frets ever get removed again. 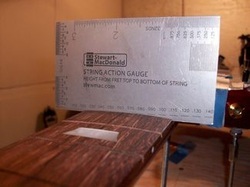 With the guitar in the neck jig it was easiest to use the Jaws 2 fret installer. 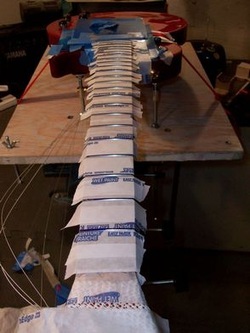 When I got near the body I pre-cut the frets to make finishing the fret ends easier without taking the chance of scratching the paint on the body. 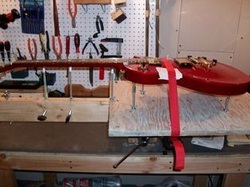 Here she is all dressed up and ready for a fret level, crown and polish. 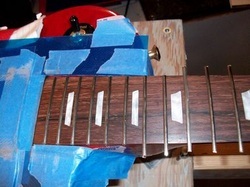 After the leveling is done I crown all the frets (round the tops) until there is only a thin line for the strings to hit which reduces fret buzz. I replaced the original (and pretty ugly) plastic looking nut with a new bone nut. After a set up she was ready to go and now plays buzz free for the first time. 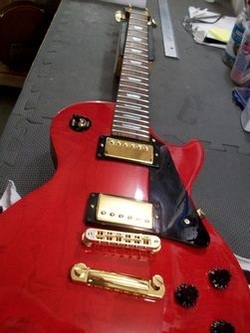 Occasionally bad guitars get through the inspection process so it is always good to have a tech check over your new guitar and get a good professional set up.